"Energy that moves the production: a dialogue among integration, project and sustainability." The XIII International Conference on Industrial Engineering and Operations Management (ICIEOM) is an international event organized by ABEPRO - Brazilian Association of Production Engineering. It reunites academic community, researchers, teachers and students, entrepreneurs, spin doctors, engineers, administrator and other professionals involved in Producing Engineering. It is one of the principal of spreading news about technical and scientific production of the area and it consolidated as a forum for discussion of themes related to Production Engineering in the international field. Click here to more informations. Dead line to send articles: May, 19th - 2007. Send here! Inscription: July, 2nd - 2007. 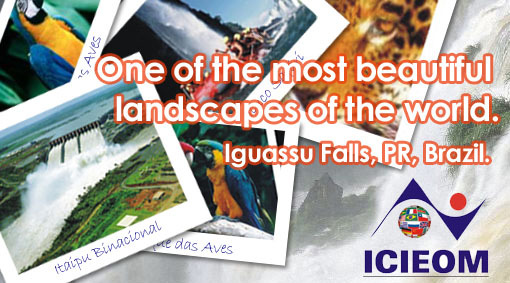 The event will be realized from 9th to 11th, October, 2007 , at Hotel Bourbon Cataratas. The XII International Conference on Industrial Engineering and Operations Management is organizate by ABEPRO - Brazilian Association of Industrial Engineering together with PUCPR- Pontifícia Universidade Católica do Paraná, by Produtrônica Laboratory.